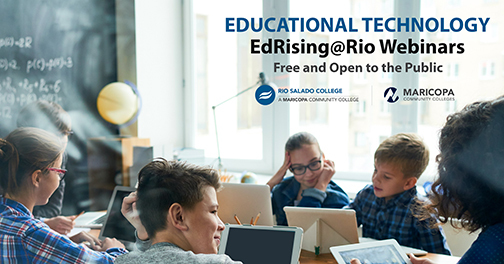 Take advantage of a free, Educational Technology webinar series for teachers presented by Rio Salado's Teacher Education EdRising@Rio team and Education Technology Consultant Lucy Gray. This webinar series will focus on teaching effectively with educational technology—available free of charge to Rio Salado Educator Preparation students, alumni and the public. Each interactive webinar is aligned to educator standards from the International Society of Technology in Education (ISTE) and includes hands-on activities and resources for further exploration. Our next webinar, Re-designing Lessons for the Digital Age is July 25! Learn more and register now for these free EdRising@Rio webinars by visiting this web page. All webinars will take place 7-8 p.m., MT. A link to the webinar will be sent to your email address with your registration confirmation.